Primary carers provide much of the day-to-day care for community-dwelling people living with dementia (PWD). Maintaining that contribution will require a more in-depth understanding of the primary carer role and the support needs that flow from that role. 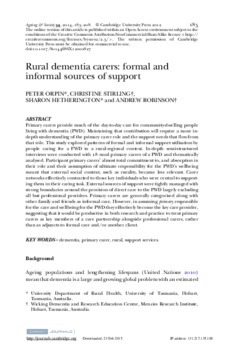 This study explored patterns of formal and informal support utilisation by people caring for a PWD in a rural-regional context. In-depth semi-structured interviews were conducted with 18 rural primary carers of a PWD and thematically analysed. Participant primary carers' almost total commitment to, and absorption in their role and their assumption of ultimate responsibility for the PWD's wellbeing meant that external social context, such as rurality, became less relevant. Carer networks effectively contracted to those key individuals who were central to supporting them in their caring task. External sources of support were tightly managed with strong boundaries around the provision of direct care to the PWD largely excluding all but professional providers. Primary carers are generally categorised along with other family and friends as informal care. However, in assuming primary responsible for the care and wellbeing for the PWD they effectively become the key care provider, suggesting that it would be productive in both research and practice to treat primary carers as key members of a care partnership alongside professional carers, rather than as adjuncts to formal care and/or another client.